So, why did they stop working on the construction of the new trestles across San Mateo Creek? 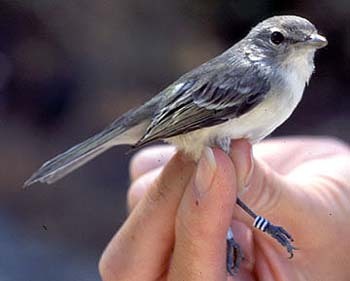 It’s those favorite birds of ours — the Least Bell’s Vireo (or LBV in the parlance of the wetlands biologists). They are those little grey birds that show up in the strangest places, though mostly near wetlands where there are lots of native plants with varying sizes and heights, or “stories.” LBV’s nest at anytime between mid-February and late August. The contractor had to leave the site since the Spring so as not to bother the poor little dears. But, now that it is almost September, the contractor will be cranking up the cranes (the yellow man-made variety) and connecting the dots between the pilings/caissons they drilled into the soil last year. Here is the San Diego Association of Governments (SANDAG for short) website describing the trestles work. It’s a little old. Hopefully, they’ll give us an update so we can start planning our Fall surfing activity. And, we hope they can get it done by February so the construction doesn’t get strung out another year. It will be nice to get rid of the chainlink worksite fence and return to our beautiful natural beach when they are finished.